We’d love your help. Let us know what’s wrong with this preview of The Elephant by Jenni Desmond. From Africa to Asia, the elephant makes its home. Light on their feet, despite their great weight, these magnificent creatures appear light and graceful because they’re always walking on their tip-toes. They have In this, Jenni Desmond’s third nonfiction children’s book about one of the large, endangered animals of Earth, we join a young boy as he learns about The Elephant. To ask other readers questions about The Elephant, please sign up. Jenni Desmond is one of my favorite illustrators. Elephant is the latest release in her non-fiction animal series. It is an absolute must have for a school or personal library. Slightly oversized and probably the most gorgeous picture book featuring an elephant that I have ever seen. Publisher Weekly’s List of Best Picture Books of 2018! What an absolutely stunning children’s book that’s fit for your coffee table. This is the third in a series of books on endangered animals: The Blue Whale And The Polar Bear being the other two. I’ll likely be picking up those two for myself for my favorite 6-year old to add to my bookshelf his bookshelf soon. Intelligent, beautifully illustrated and fun, this is one of the best children’s books - if not the best - I’ve come across this year. Publisher Weekly’s List of Best Picture Books of 2018! Intelligent, beautifully illustrated and fun, this is one of the best children’s books - if not the best - I’ve come across this year. I love how the author provides easy and concise distinctions between the two species of elephants alive today: the African and Asian. It’s fun, educational and also quite thorough for youngsters of any age. There’s a beautiful two-page head shot of an elephant that’s worth the price of the book alone. If it sounds like I’m excited, I am. Gorgeous. And that two-page spread of the elephant face? Just stunning. I love elephants! The illustrations are gorgeous. The Elephant is a beautifully illustrated nonfiction book that teaches children about the endangered elephant. This nonfiction book is slightly different than others because it has illustrations rather than photographs. There is also a little boy wearing a crown that appears on a few of the pages, although he does not say anything. This book is a great example of a nonfiction book because it has great facts and information about Elephants. Although it almost looks like a traditional story with t The Elephant is a beautifully illustrated nonfiction book that teaches children about the endangered elephant. This nonfiction book is slightly different than others because it has illustrations rather than photographs. There is also a little boy wearing a crown that appears on a few of the pages, although he does not say anything. This book is a great example of a nonfiction book because it has great facts and information about Elephants. Although it almost looks like a traditional story with the illustrations, there are still some nonfiction text features to help the reader better understand elephants. There is a map to show where the elephants live and there are diagrams comparing and contrasting the African and Asian elephants. This book also has great visuals to show how heavy an elephant is, what its feet are really, and how long its tusks are. The illustrations in this book are so beautiful and detailed and they really bring to life the information that is in this book. This author also has a book about polar bears and one about blue whales. I really want to check them out now! There are many ways I would use this book. I could use this book to teach certain text features such as maps and diagrams since those features are in the book. I could also use this book with our informational writing unit. The students could use this book to pull facts and information about elephants to write an informational piece. When a planet is in peril, so are its inhabitants. Humans and other living plants and animals have been and are facing challenges never experienced in previous generations. Even with their marvelous methods of adapting to survive, humans' companions, plants and animals, need us to make choices in their favor every single day. A little more than two years ago the Great Elephant Census was completed and released. It indicated the population of African elephants except for forest elephants, which are too difficult to count from the air, has diminished 30% in seven years. According to a National Geographic post regarding the census about 27,000 elephants are killed every year, mainly from poaching. (If you want to make a comparison, look up the population of your community. My community would be entirely eliminated five times in one year.) It is believed the numbers for the Asian elephant population are even worse. Author illustrator Jennie Desmond awakened and enhanced our awareness in her titles The Blue Whale and The Polar Bear. In her newest title, The Elephant (Enchanted Lion Books, September 25, 2018) she again draws our attention to one of the largest animals on planet Earth. Unless we are residents of those places where elephants reside in Africa and Asia, we will never see them in their natural habitat. Jenni Desmond brings us to where they roam through her informative words and striking illustrations. I honestly do not think that I have ever learned so much about an animal species that I didn't know until I read the Elephant or have it stick in my mind because it was so easily presented. True, Elephants are not something that I come across every day or ever, but still, I can now tell you and I bet your kids could tell you after reading the differences between the two main species, their genders, their skins, their food, their gestation periods and more. Considering how many books I read a yea I honestly do not think that I have ever learned so much about an animal species that I didn't know until I read the Elephant or have it stick in my mind because it was so easily presented. Elephants are intriguing and appealing to people of every age, and this book should be the same. The combination of scientifically accurate portrayals of subspecies, habits, habitats, and patterns of elephants combine with the enfolding premise of a young boy who is serious and clever and loves to read about elephants. A variety of "facts" about elephants, both African and Asian, can be easily forgotten or confused, even when various memory tricks are provided. but after reading and examining th Elephants are intriguing and appealing to people of every age, and this book should be the same. 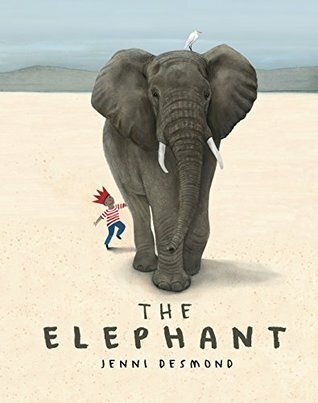 The combination of scientifically accurate portrayals of subspecies, habits, habitats, and patterns of elephants combine with the enfolding premise of a young boy who is serious and clever and loves to read about elephants. A variety of "facts" about elephants, both African and Asian, can be easily forgotten or confused, even when various memory tricks are provided. but after reading and examining this book, those facts seem to have sorted themselves in my mind quite clearly, and with a sense of permanence. That accomplishing a lot for a picture book, especially one with no attempt to anthropomorphize the animals or otherwise remove them from real science. Adults will appreciate this book more than elementary children. While I love the art and facts, my students still prefer animal books with photographs or cartoon type illustrations like Eaton's The Truth about Elephants. In my opinion it's best suited for a parent to buy or checkout from the library to read with their child. A bit too long for a teacher read aloud. Break it into two sittings for grades K-3. 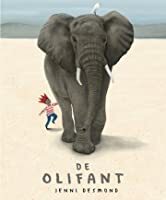 Ik vond de olifant erg leuk en leerzaam. Op een verhalende wijze geeft de schrijfster informatie over de olifant en de prachtige prenten ondersteunen het verhaal. Ik vond het erg grappig dat het boek zelf ook nog in een prent voorkwam. De informatie is toegankelijk voor jongeren kinderen en het taalgebruik is zeer rijk. Moeilijke woorden worden niet geschuwd, maar wel uitgelegd. Een vorm als deze is veel leuker dan een informatieboekje of het opzoeken op internet. I am a fan of Desmond's books. They are equal parts informative and lovely. Though she writes about animals we are familiar with, she always manages to add information that I find surprising. In this book it was that one of the differences between Asian elephants and African Savanna elephants is that the former have a one-fingered trunk, while the later has a two-fingered trunk. Once again the illustrations are stunning. This was a fantastic picture book with really amazing illustrations. I love how the book starts out as a kid reading a book, and then continues to use the kid in the illustrations. I only wish the entire book was written like a narrative like the first couple pages were. It was a little disjointed with the beginning feeling like a story and the rest feeling like an informational book. Still fantastic though! A charming non-fiction picture book perfect for the little (or big!) elephant lover in your life. Having the image of the child reading the story in the book appear in the illustrations will help children connect to the world of these amazing animals. A gentle and peaceful read. Recommended! I received a digital ARC from the publisher via Edelweiss+. Reminiscent of How to be an Elephant by Katherine Roy, this non-fiction book is full of varied information about elephants. Uniquely, this book also has a fictional twist by incorporating a little boy who appears as a silent character reading the same book. The illustrations beautiful with rich detail. The elephant illustrations are well rendered in various art media, while simpler images help a young reader understand various facts about these wild creatures. A great introductory picture book, although I expected to see some footnotes or references at the end. I did not know very much about elephants before reading this book! They're very interesting! The pictures are also really great. I will definitely check out Jenni Desmond's other picture books about endangered animals. Information text about elephants is sandwiched between a young boy starting a book and waking up from a dream at the end. Illustrations provide further info to support the facts provided. Elementary level readers will follow the data provided. I learned a lot about elephants from a childrens book. A must gift for an animal lover. beautiful & informative, my favorite! This may be my favorite picture book about these amazing creatures, however, I am very disappointed at the lack of backmatter. Beautiful, informative and fun! A charming blend of solid nonfiction and whimsical story in a wonderfully appealing package. Gorgeous and so informative. I learned so much and love the elephant even more than I already did. Recommended. Beautifully illustrated and full of amazing facts about elephants; this book is a treasure. What a beautiful story about elephants! This book is full of very interesting elephant facts and wonderful illustrations. Jenni Desmond graduated from a Masters Degree in Children's Book Illustration at the Cambridge School of Art (UK) with distinction and her debut book won the Cambridgeshire Read it Again! Award in 2012. Her books have been translated into over a dozen languages since, and in 2015 Desmond was named Best Emerging Talent (Illustrator) at the Junior Design Awards (UK). In 2016 she was made a Maurice S Jenni Desmond graduated from a Masters Degree in Children's Book Illustration at the Cambridge School of Art (UK) with distinction and her debut book won the Cambridgeshire Read it Again! Award in 2012. Her books have been translated into over a dozen languages since, and in 2015 Desmond was named Best Emerging Talent (Illustrator) at the Junior Design Awards (UK). In 2016 she was made a Maurice Sendak Fellow and her book 'The Polar Bear' became a 'New York Times Best Illustrated Children's Book' of the year.